My Notting Hill: Pantone Color of the Year 2015 Marsala?? Pantone Color of the Year 2015 Marsala?? Pantone has declared Marsala the 2015 Color of the Year. I'm not feeling it - how about you? And, I don't know what I'm supposed to make of the man model's love triangle expression in Pantone's promo kitchen? Whatever it is, I'm not feeling that either. Ha ha! Your "love triangle" comment made me snort. Nope not feeling it either, not a WOW color is all I can say. totally agree ! That color is awful...sort of depressing tone ! Won't be using it in any of my design projects ! I hate that color. I think I might have liked it in 1991. I showed it to my my husband who shared in the feeling and my 17 year-old daughter (who was already wearing pants that color) said "Oh yeah, its a really trendy color--my favorite." Sigh. The richness in the pot of color does not match up with the paint cards I see which are quite drab, so no not thrilled! Two months ago I purchased 20 yards of linen velvet to upholster an antique couch in so I'm very happy about it being the color of the year. At first I thought - oh yes, it looks like a rich glass of wine. But it has a muddy brown undertone. 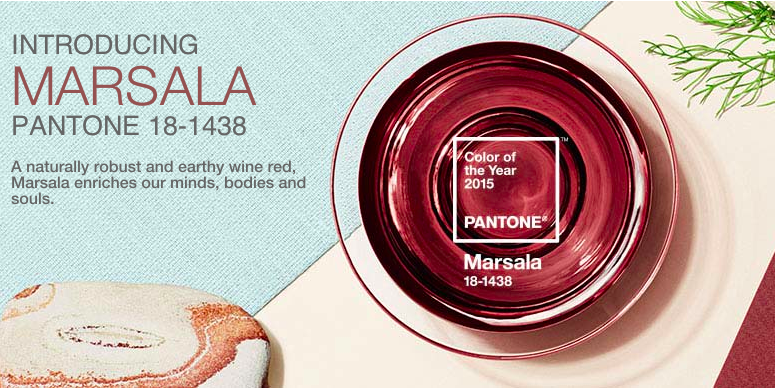 The photo of "Marsala" reminded me of nail polish (maybe I'd wear it on my toes, ha, ha). Creepy photo of those folks in the kitchen! I would love it for lipstick or nail polish but I don't see using it in any of my decor.